Some Days are Meant for the Couch…. Or Dialing in My Wife’s Bike, THEN the Couch. August 30, 2017 11:00 am / 11 Comments on Some Days are Meant for the Couch…. Or Dialing in My Wife’s Bike, THEN the Couch. We had two of the stranger weather days I’ve ever seen. Storms just popped up and sat there. No wind, no movement. My wife and I were leaving the meeting place from the Tuesday night ride, without having actually ridden. 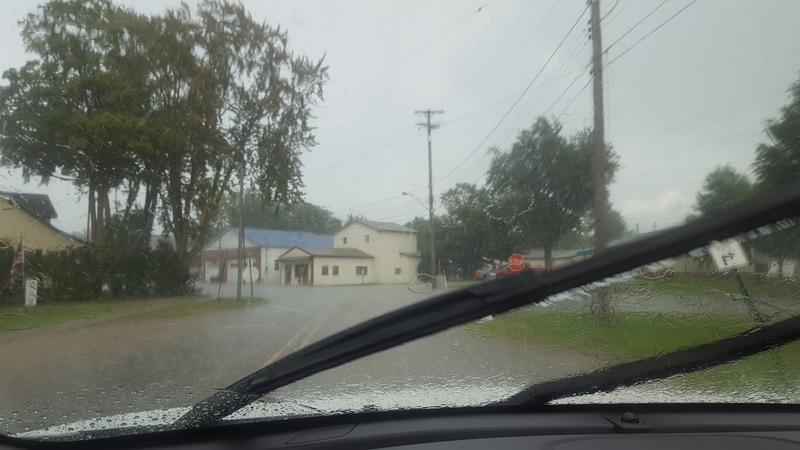 Dude, I’ll do a lot to get a bike ride in, but not in that. Five miles south, the sun was shining. When we got home, with the sun shining, my wife and I got ready and headed out. A mile north and two east and it was sprinkling with the sun shining. Dejected, we turned it around and headed home. Where the sun was shining. Three miles made that much of a difference. Rather than go in and write the evening off, I grabbed my Allen wrench set and we took to dialing in my wife’s new saddle. My wife is insanely difficult with saddle location. Think the princess and the pea and translate that to bike saddles. After four adjustments, we think we have something to work with. That’s after three previous adjustments over a few days. The most frustrating part for me is in wanting my wife to be able to feel good in her saddle while struggling so mightily to make it happen. By comparison, it takes ten minutes to dial my own saddle in. I take a 5mm Allen wrench with me on a short ride. A little nose down, a little move back, nose up just a hair…. done, perfect. It’s been a lot tougher getting my wife set up, and we needed that time to concentrate solely on getting that saddle dialed in. Hopefully that’s the difference. After, a light dinner and some fun couch time with my wife and kids. I don’t even know what time it was I dozed off…. I’ve ridden three road bikes over 40,000 miles since I started riding just six years ago. I’ve ridden on super-cheap all the way up to decent wheels, but limited to aluminum only. I’ve had “bomb-proof” Rolf Vector Comp’s, Specialized El-cheapo DT Axis 4.0’s (I despise these wheels), a set of hybrid Vuelta Corsa SLR/Velocity wheels I had built after the Vuelta’s ran into big problems due to lightweight rims, and a set of old-school cheap wheels that came with my ’91 Cannondale SR-400. That said, I’m going to concentrate on two sets of wheels for this post to keep it simple: The DT Axis 4.0’s and the Vuelta/Velocity Hybrid set. For the record, the DT’s are more “aero” that the Vuelta/Velocity set. Not by much, but the DT’s offer a better profile. That said, the Vuelta/Velocity wheels are vastly faster and more enjoyable to ride. The differences come down to the hubs (and I’ll be replacing the hubs on the DT’s as soon as disposable income allows). The Vuelta hubs are closed bearings while the DT Swiss hub internals are the old-school cone race, loose bearing type. The Axis 4.0’s simply don’t roll as well…. and they’re impossible to get all of the play out of the rear hub without making the bearings too tight to roll. A while back, a blogger/racer I hold in high regard wrote a list of important features to look for when purchasing a bike, I believe it was a top ten. At the top was a good frame. Wheels were all the way at the bottom of the list, least important. I don’t own a poor frame, but I do own a decent frame and a top notch frame. I also don’t race, so I assumed he knew better than I about the order of importance of the two. I respect his opinion, but as far as enthusiastic road cycling goes (lots of miles, very fast), In my experience, good wheels trump a good frame. I ride two bikes with regularity. A race bike and a rain bike (a road bike dedicated for crappy weather). The race bike gets the upgraded “good” wheels and the rain bike gets the cheap, “came stock on the race bike”, wheels. 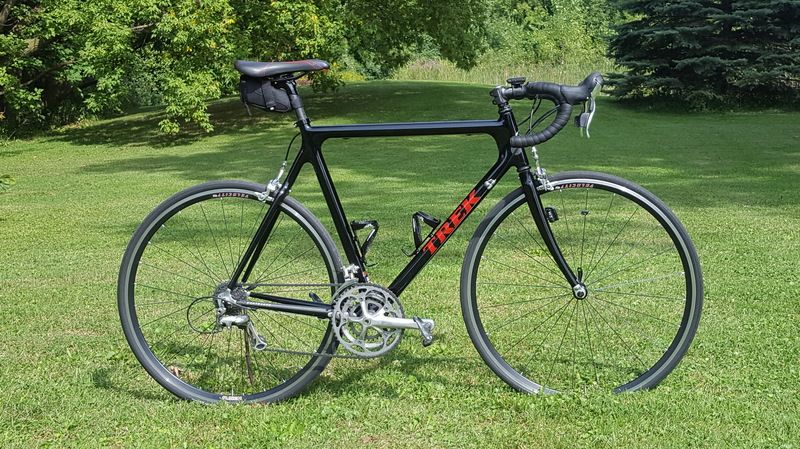 The Trek, with the cheap wheels, is a ho-hum ride. It’s acceptable, but not noteworthy, and slower. Put the upgrade wheels on that bike and it’s transformed from a decent ride to a great ride. Follow that to its logical conclusion and put the cheap wheels on the Venge and they take the Venge from a rocket ship to an “above average” frame at best. Having considered this over the last week-ish, with the proper set-up, a good set of wheels can improve a frame’s characteristics. Having my druthers, I would take a decent set of wheels over a great frame, any day of the week and twice on Sunday. Up until three weeks ago, there was never a question which bike I’d take on a long tour…. 385 Miles of glorious bicycle miles over four days. I have a bike tour coming up next month and I have a decision to make about which bike I’ll ride. I’ve chosen the Venge every time. It’s three or four pounds lighter and it’s always felt a bit better than the 5200 to ride. That is, until I fitted the Trek with a new seat post and a new saddle. The saddle completely changed the bike’s ride characteristics, to the point the 18 year-old Trek rides better than the Venge. There was a time, six months ago, I thought about buying a new Specialized Roubaix, the ultimate “squishy” endurance bike. You know, the bike the pros turn to for the Paris-Roubaix race. Not anymore. I don’t need it. The 5200 is that good. It might not be that good, of course. I’ve never ridden a Roubaix, so I really have no idea… but the Trek rides so well now, spending $4,000 on a new bike seems silly. There’s another plus with the Venge that made it a shoe-in to go on every tour I’ve ever done; It’s fast. Noticeably, indubitably faster. Like, bounce you too close to a star and end your day real quick, faster. I know, you’re thinking there’s no way a bike frame could matter that much. It sounds nuts… but it’s true. You push on the pedals and the Venge goes. The difference isn’t enough it can’t be made up for with “want to”, but when you’re riding that far over four days, well, you to take the bike that makes you work less. There’s an “except” now though. The Trek is a smoother ride, and that makes up a little for the vastly superior aerodynamics of the Venge. We’re not done yet, though. Zoom into the crank on that top photo. Triple. The Trek has always been a better climber. By a lot. Even though it’s a little heavier. Add to that, the ability to carry a saddle bag on the Trek (I can’t bring myself to defile the Venge with one), so I have pocket room to spare for a vest or arm warmers, the Trek has become a no-brainer. So, I’m going to roll the Trek exclusively for several weeks before the trip so I can make sure I’m good with the setup. 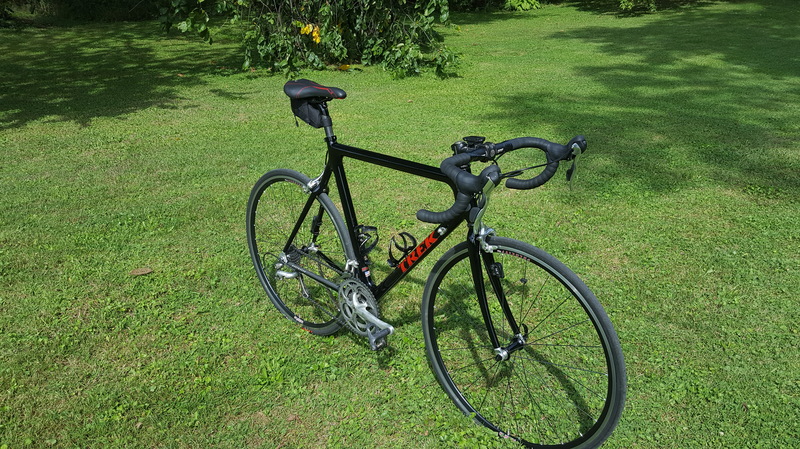 I also switched out the cheap wheels on the Trek for the wheels on the Venge (they roll faster, about 5 to 10% maybe, and they’re 3/4’s of a pound lighter between the two)…. Sure enough, I’ve been trying to nail down a creak in the Trek for two years now, and I was sure it was in the bottom bracket. I tightened down everything else. After switching out the wheels yesterday morning, I rode a perfectly silent 100k. Not. One. Creak. Not even out of the saddle. The creak is somewhere in the other wheels, possibly the quick release skewers? Well smack my heinie and call me sunshine. I never would have guessed. Fitness and Fun; Desire and Dedication. And a Side of Happy. Bikes are the Answer to All of Your Fitness Needs…. If done Correctly. August 27, 2017 11:01 am / 4 Comments on Fitness and Fun; Desire and Dedication. And a Side of Happy. Bikes are the Answer to All of Your Fitness Needs…. If done Correctly. My friends showed up Saturday morning and we rolled out, after Gary and I tinkered with his front derailleur to get it to stop dropping the chain into the bottom bracket when he was in the three easiest gears on the cassette…. Fortunately, I have a good set of cycling tools I carry in a duffle bag. We all know riding with friends always beats riding alone. Maybe we don’t…. It does, trust me. From safety in numbers to laughs and good conversation, there’s nothing better. We had some real wind to contend with for the first time in at least a month so having a draft to rely on was awesome. That said, the 2 hours 35 minutes went by pretty fast. Sunday morning was more of the same, but we chose a different route, better for those light breeze days because it’s straight west, a little south, then a lot of west. We had eight so a perfect double pace line. I was feeling surprisingly strong, considering I’d helped a friend of mine hang some drywall after riding on Saturday and I figured I wouldn’t be worth much. I helped bring the group back together a couple of times and stayed with one of the guys who had to deal with a flat so I could help him back, too. Quite often it’s suggested that we ride in a group that has cyclists just a touch faster than we are so we can get faster. That great to a point, and maybe once during a weekday ride that’s a brilliant idea. On the weekends, though, might I suggest riding in a group of people who are your equal. Not only can you enjoy some excellent conversation and laughter, if someone drops you’ll be able to help them back. Not much feels better than helping a compadre back to the group. Well, at least not much that can be done with clothes on. But that’s a story for a different blog. Cycling opens up a whole world of awesome when it comes to fitness, but when done correctly with a club, the fitness is more a side-affect. Einstein is quoted as saying, “You can’t fix a problem with the same mind that created it” or a variation on that. Here’s my twist: I cannot fix my alcoholism with the same drinking that created it in the first place. The idea is simple but the fix isn’t. I know of treatment centers that have recovering people sitting in the same waiting room as people waiting for their daily hit of methadone. It gets better, those who have already taken their hit and are effectively sitting there stoned. This is so-called “evidence-based” recovery, or more to the point, this is what you get when those who know nothing about recovery try to implement a recovery program. I mean someone who studied sociology in college, got their degree, and figures they know about recovery and addiction because they learned about it over a few chapters in a class or two… and they’re smart. Put a newly recovering person in that situation and they’re drunk or shooting up again within a week, or they’re on methadone again. If you put someone with a year of clean time in that situation, I would expect they would sit through it once, never to return. They would likely remain cordial, quiet and reserved. You put me in that situation and… well let’s just say you could expect an enthusiastic, proactive response, followed by my laughing at you as I walk out the door. It takes a special kind of stupid to put newly recovering people in that situation. We have this funny saying, “You sit in a barbershop long enough, eventually you’re getting a haircut”. In the case above, the counselors are actually taking the barbershop to the addict. You can’t fix an addict with the same use that created the addict in the first place. We get away, or we get dead. It’s simple as that. I cannot fix my alcoholism with the same thinking, the same sickness that created it. Don’t take my word for it though… You go right ahead and bang your head against that brick wall. I’ll be over here enjoying my existence. See me when you’re tired of failing so we can change that thinking a little bit. This isn’t revolutionary thinking actually. It’s been around for a little more than 80 years. It was uber-revolutionary back then though… if that makes you feel better. Getting Back to Fast…. Slowly. August 25, 2017 11:00 am / 7 Comments on Getting Back to Fast…. Slowly. I’m tired. I could feel it last night, bad. That is, until I got back from my easy Thursday evening ride. I just wasn’t feeling the love as I headed out. Five miles in and I stopped to help a couple stranded because they managed to drop their timing chain. I was unfamiliar with their type of eccentric bottom bracket that didn’t gave Allen wrench locking keys, it used a rather large nut (22-23 mm?) instead…. I simply didn’t have anything to get slack in the chain to set it back on the cog. Fortunately they had a ride coming to pick them up. How they dropped it is beyond me. I got rolling again and I smiled at how good my feet felt. The new shoes are awesome. The toe box is a little bigger so my dogs have enough space…. The real test will come this weekend when I put some decent miles on them. The timing will be impeccable, but more on that later. Getting back to my tired legs. I wish I could describe this more aptly, but I just don’t feel very powerful lately. I’m missing some liveliness that should be there. I know the answer, thankfully. I think a day off on Monday is in order. That, and another slow day today before we hammer out some good miles over the weekend. I stopped at the shop to say hi to my friends before they rolled out for their ride, then headed home. I pulled into my driveway expecting maybe a high fifteen, low sixteen mph average, based on how I felt and because my aim had been to ride slow anyway…. 17.8. Maybe I’m not as tired as I thought. Sadly, I think I liked it better when everything made sense. Chuckle.